And here we are again, with another Personal Series Challenge for 2018. Because what I do best, apparently, is start a whole bunch of series and leave them hanging... or sometimes just make miniscule progress by reading one or two books, then moving onto the next series. I'm changing my rules a little bit this year, and combining last year's 'Goal #1' with 'Goal #2'. It's hard to tell what series will be completely completed sometimes, so I'm just going to make three different categories this year. The above are the specific series I will be focusing on, especially the Harmony series. 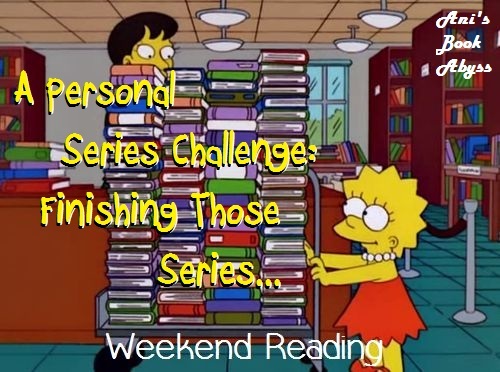 As I have another ongoing challenge with Jayne Castle books, this shouldn't be a hard task--and also, there are only four books of this series left to catch up with... unless she publishes a new book this year. Meanwhile, at least three of the series listed may not pose as a challenge, considering there are only one book left, but whatevs. There are a lot of other series also needing read, so we'll work on those as well. At the time of this posting, I have already finished the most recent installment of Laura Griffin's Tracers series, at book number twelve. So that's one series caught up with until further notice. Considering there will usually be at least one new publication a year, I'm betting that I'll be reading another Tracers novel before long. Okay, so I have a LOT more than six new-to-me series that I want to read. However, if I were to list every single one of them, we would be here forever. So I just randomly chose six... mainly because if I chose more than that, I'm not sure all the covers would fit above on one line unless I really shrunk the size down. So believe me, there are a ton more, and there's a big chance I may even get to some others before I get to the ones I've listed above. Even if the six above are really the ones I'm most interested in at this time. What I rambled on about in my second goal above... same here. That's really all. Lots of series I want to take for a test read... no way of really deciding where I want to start. Yeesh!